Our 2017-18 schedule has been announced and tickets are now available! To keep informed of concert and event announcements, subscribe to our mailing list. Join the Toronto Concert Band and our special guests, the Norwegian Travelling Band, as we meet and rehearse together for the first time, in this special event presented by the Royal Conservatory of Music. This is an informal event with limited space available. Drop in, hear us rehearse, and socialize with the members of both ensembles. To hear us, head over to the Temerty Theatre at the Royal Conservatory of Music, 273 Bloor St. W. in Toronto. Enter through the glass doors and head up to the second floor. Our bands meet for the first time just a little earlier in the evening, and we’ll be playing music from our own repertoire for one another, rehearsing some music jointly, and generally having a good time. We hope that you enjoy the night of behind-the-scenes music preparation! The TCB will perform most of the music you’ll hear on Saturday at our fall concert, November 24th at Glenn Gould Studio in Toronto. 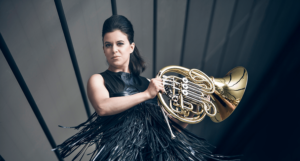 Our November 24th concert features the Canadian Premiere of Gary Kuo’s Wingspan, introduced in person by the composer and performed by horn virtuoso Olivia Esther, Respighi’s The Pines of Rome, the works of Roland Barrett, J. S. Bach, G. F. Handel, Toto, The Who and more! Two other concerts will be held this season, including Saturday, February 23rd, 2019 at 7:30pm at Metropolitan United Church, in a special joint performance with the Etobicoke Youth Band, and our fiftht anniversary concert on Saturday, June 15th, 2019 at 7:30pm at Glenn Gould Studio. 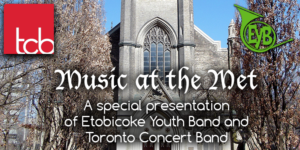 Join the Toronto Concert Band for a special joint performance with the Etobicoke Youth Band at Toronto’s glorious Metropolitan United Church in the heart of the city, at Church Street & Queen Street East. Each band wil perform on its own, and will then combine for a grand finale of nearly 200 musicians on stage to close the concert. The bands will perform favourites including Jacob de Haan’s Ross Roy, John Williams’ famous theme from Superman, excerpts from Les Misérables, Debussy’s Engulfed Cathedral, and much more. Join the TCB for a special fifth anniversary celebration at Glenn Gould Studio in the heart of the Entertainment District.